A version of this article was first published by the Ecumenical Stewardship Center in the Giving: Growing Joyful Stewards in Your Congregation magazine volume 21, no. 1. The work of stewardship is deeply connected to faith formation, discipleship, and practices of religious life. Through stewardship, faith communities and the people who lead them have the opportunity to truly invite others to discern purpose and make meaning in their lives. The way we communicate this invitation really matters, from our language to the platforms we use to connect with others. When we create opportunities for people of faith to participate in the life and ministry of the church through their generous giving, we are inviting them to live out their faith by attending to the capacity they have to make a difference, and this is whole-life stewardship in the truest sense. When we share the vitality and significance of our mission with others, we are communicating about the work that God is doing in the world, indicating the ways in which our human lives can be joined up with that sacred work. This is the power of our witness to the goodness of God. 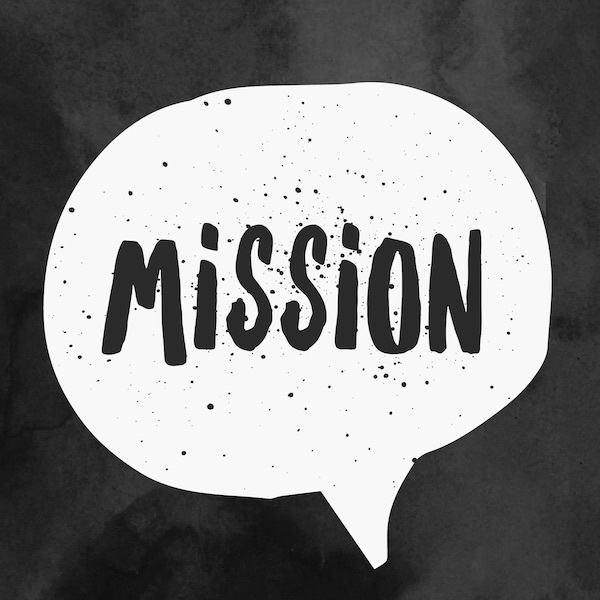 We have an opportunity to help others see what might be possible for their own gifts, in sharing about the mission that we are called to serve through our religious institutions and individual vocation. When we understand stewardship in this way, we can’t help but share far and wide about the good work we are called to do. The language that we use to describe the work we are called to do really matters; language shapes the story that we are telling, and colors the perceptions of our audience as they learn about our organization and its mission. Similarly, the words and frameworks that we employ in stewardship have the potential to help us or hinder us, to enhance or inhibit the generosity of our constituency. We can use language that demands and obligates, or we can communicate invitation and alignment through the way we talk about faith and giving. In fact, there is a lively conversation to be had about the best way to describe “stewardship” itself. Should we talk about fundraising, development, generosity, or mission advancement? Is the work of raising money part of “external relations” along with communications, marketing, outreach? Or, is this work primarily focused on faith formation, which would make stewardship, discipleship, and tithes and offerings the better categories? Like so much of ministry, this must be settled by the context; the way we talk about money in our institutions should reflect the cultures we inhabit, but it will also shape those same cultures. If we can choose with intention the vocabulary that frames our fundraising work, we can shift the narrative. We will move away from a competitive, zero-sum model of transactional, bottom-line fundraising to resource our ministries, toward a development approach that nurtures the spirituality of leaders and stakeholders, while inviting a deeper partnership for mission and impact. The result, financially, might be exactly the same, but the implication for mission is quite different. When we are intentional about the kind of language that we would use for stewardship and fundraising, we have the opportunity to tell compelling stories that open space for invitation. Stories allow our readers or listeners to identify the alignment between their own sense of vocation and the mission of the organization. When we find ourselves in a story, or are so compelled that we want to connect with something good happening in the world, we are moved to act. Storytelling can push us toward a practice of integrated, big-picture stewardship. This stewardship of all our gifts requires careful attention to the details, so that we don’t miss any of the beauty along the way. We can invite others into shared mission by telling stories in the context of worship, teaching, or fellowship, or through our written communication. The bulletin, newsletter, website, or social media are all prime outlets for our storytelling. Our consistent use of theological language on those platforms can transform the perception and expectation around stewardship and fundraising, by making familiar the missional, invitational, and relational approach. Stewardship and fundraising are not simply about money, time and resources; they are also about the way in which people of faith relate to those resources, and to one another. By using language that centers relationship, spirituality, and invitation, we can make stewardship a primarily missional activity, rather than an instrumental one. Communicating consistently and intentionally about this focus will open up the opportunity to move away from a transactional approach to fundraising, and will instead help our communities to see the remarkable opportunities that are available when we understand the deep connection between stewardship and a mission of good news. Are the same words used in worship and committee meetings when you talk about raising money in your institution? Why or why not? What stories are you telling about your congregation? How is your congregation inviting others into the mission? We were in southern Indiana for the weekend spending time on the property of the church camp I attended during my teen years. I was back there with a different set of teens – a youth group of high schoolers I was now leading. We were spending the morning doing some team building activities. First, we all stood on long boards trying to flip flop the order without anyone touching the ground. Then we had to get everyone through a spider web of ropes suspended between two poles. Finally, there was a wall that everyone needed to climb over. Throughout the first two obstacles I stood to the side with a young woman with cerebral palsy. She didn’t have the ability to stand safely on the boards while the group maneuvered themselves from one end to the other. But, she was happy cheering them on, offering a different, yet necessary, kind of support. We also stood to the side during the spider web activity because she’d recently had back surgery and I didn’t want to risk her being dropped while being passed through the ropes. When we got to the wall, once again we stood to the side. I didn’t see how she’d get up over that wall, even with assistance. However, it was at this point that her older brother and his friends stepped in. They were tired of seeing her stand to the side. I had only known this young woman for a year, they had known her much longer than that and they were clear about her abilities – obviously clearer than I was. Together, these young people helped her get over the wall. They invited her in. They provided ability and skill where she lacked. They offered hands and backs and strength to get her over the wall, just like everyone else. I learned a valuable lesson that day. I learned the joy of inviting someone away from the sidelines and into the action. I learned that with help, everyone can participate. I learned that there’s always more to learn! Whether she went over that wall or not, the group would have grown as a team. 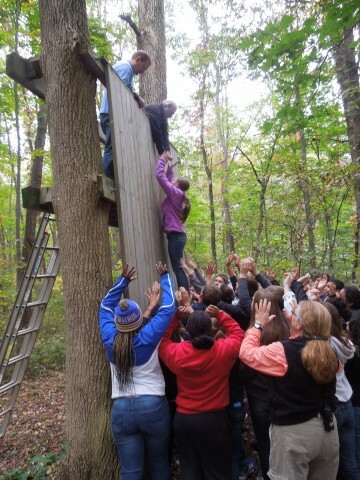 However, by working together to support her, the real team building took place. When she arrived on the other side of that wall, everyone celebrated! A mission isn’t meant to be achieved alone. When we invite others into our mission, to join in on the hard work, to support one another, everyone gets to celebrate! Who is standing on the sidelines waiting for an invitation from you? We have a full schedule of ECRF courses this year. All of the links are now available for registration including Fuller Theological Seminary in July and Discipleship Ministries of the United Methodist Church in August! Lake Institute is partnering with Ecumenical Stewardship Center and several other denominations to host ESC's annual spring conference in Indianapolis, April 30-May 2. In addition to top-notch keynote speakers, we will present initial findings and early results of the National Study of Congregations' Economic Practices.